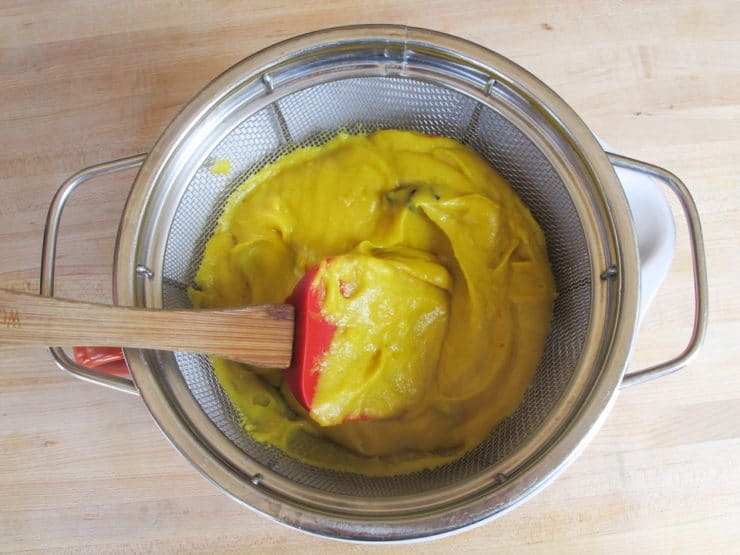 I’m sharing this vibrant golden pudding in honor of my dear friend Catherine McCord and her “virtual baby shower!” Catherine’s blog Weelicious is the go-to resource for healthy, kid-friendly recipes. I always recommend her two cookbooks, Weelicious and Weelicious Lunches, when people ask me for recipes that kids will enjoy. 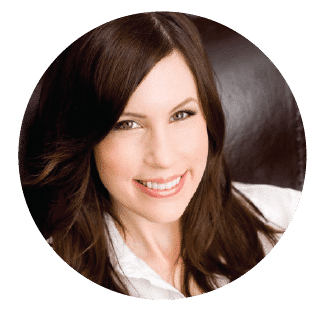 I was so excited to hear about Catherine’s surprise online baby shower, especially when I heard the theme was “Naturally Colorful.” A rainbow of recipes without a hint of food coloring seemed like a perfect way to celebrate Catherine and her healthy approach to family friendly meals. Catherine is one of the kindest, most special people I know. She’s an incredible mother and she has a heart of gold. 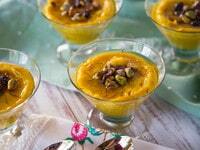 What a perfect opportunity to share this delicious golden Persian Saffron Pudding. I’ve been keeping this one under wraps, and I’m excited to finally share it in honor of sweet Catherine and her new baby! 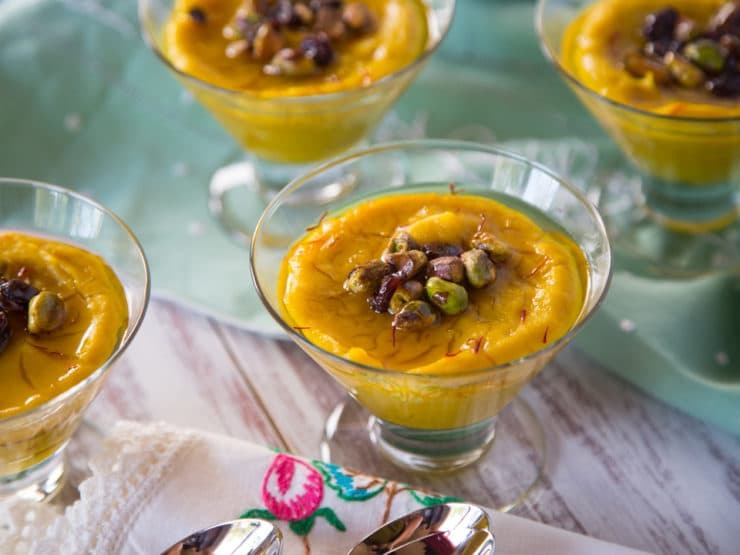 This exotic golden dessert is a fusion of two traditional Persian treats– sholeh-zard, a sweet rice pudding made with saffron and other spices, and fereni dagh, a smooth, sweet pudding made with rice flour, rosewater and spices. Combining the flavors of sholeh-zard with the smooth texture of fereni dagh produces an absolutely lovely dessert. The addition of a floral orange blossom syrup really puts it over the top. Floral waters are well suited to sweet desserts and can really add a special essence; my Pistachio Rose Blondies with browned butter are my most-requested homemade dessert. This pudding runs a close second; people absolutely love it! I particularly appreciate how versatile this dessert is; it suits a variety of dietary restrictions due to the fact that it is gluten free, dairy free and vegan. 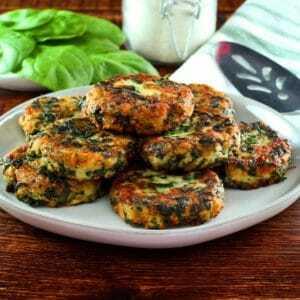 It’s also great for dinner parties; make it ahead and chill it, then serve without any fuss. Easy, colorful and delicious… what’s not to love? Congratulations, Catherine! Can’t wait to meet the lucky little one. 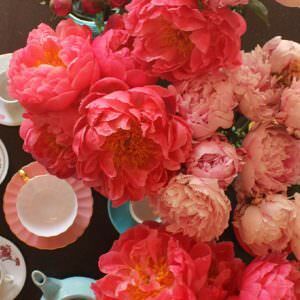 Check out all of the other colorful contributions to Catherine’s virtual baby shower from my friends below! 1/2 tsp saffron use a good quality, expensive saffron; Iranian or Spanish is best. The cheap stuff has no flavor! 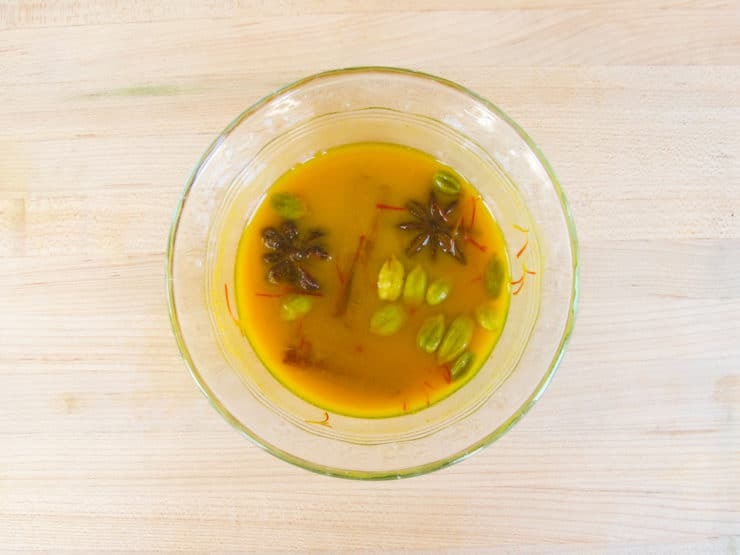 To make the pudding: In a small dish, combine the cinnamon stick, star anise, cardamom pods, saffron and turmeric and cover with 1/4 cup hot water to bloom the spices. 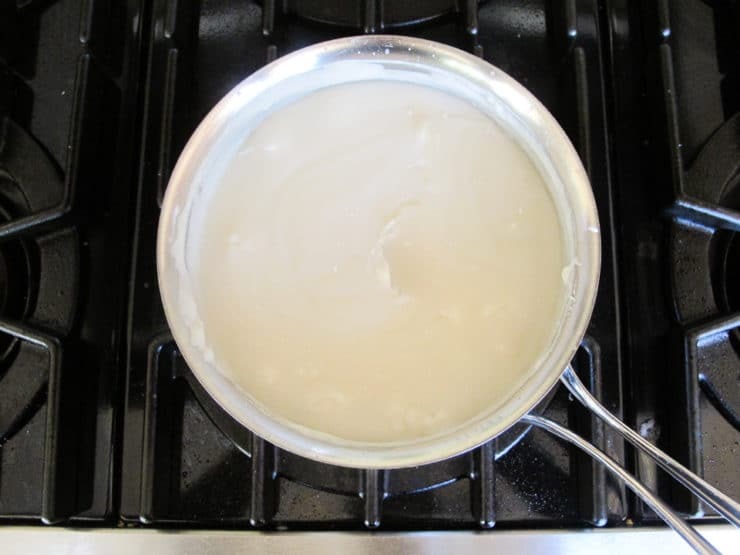 In a medium saucepan combine coconut milk, water, sugar and salt. 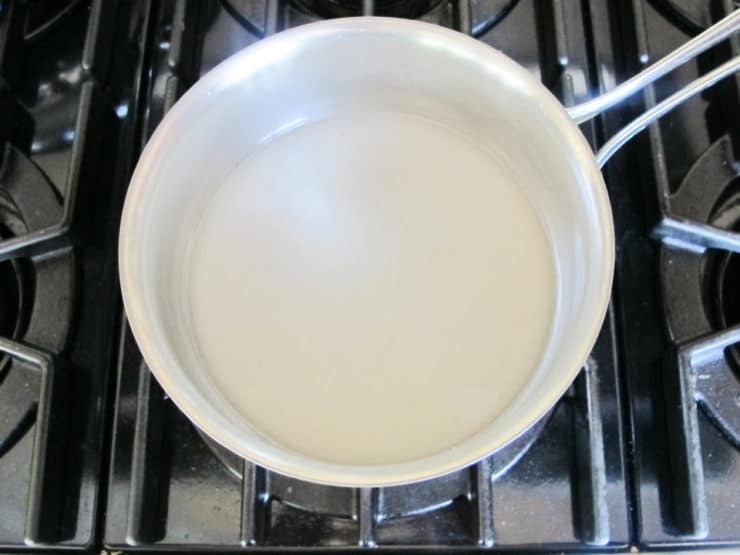 Bring to a boil, then reduce to a simmer and slowly whisk in the rice flour until smooth. Add the dish of spices and stir until thoroughly combined. Cook for 15-20 minutes, stirring frequently. Remove from heat and transfer to a mesh strainer set over a large mixing bowl. Push through with a spoon or spatula to remove any whole spices. Divide pudding evenly between 4-6 dishes and refrigerate to cool before serving. 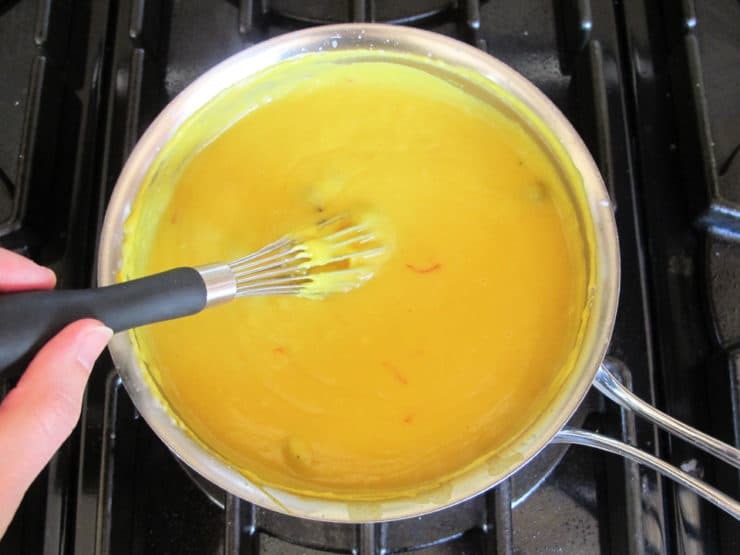 To make orange blossom syrup: Combine all ingredients in a small saucepan and bring to a boil over medium heat. Remove from heat and allow to cool. The syrup will thicken upon standing. 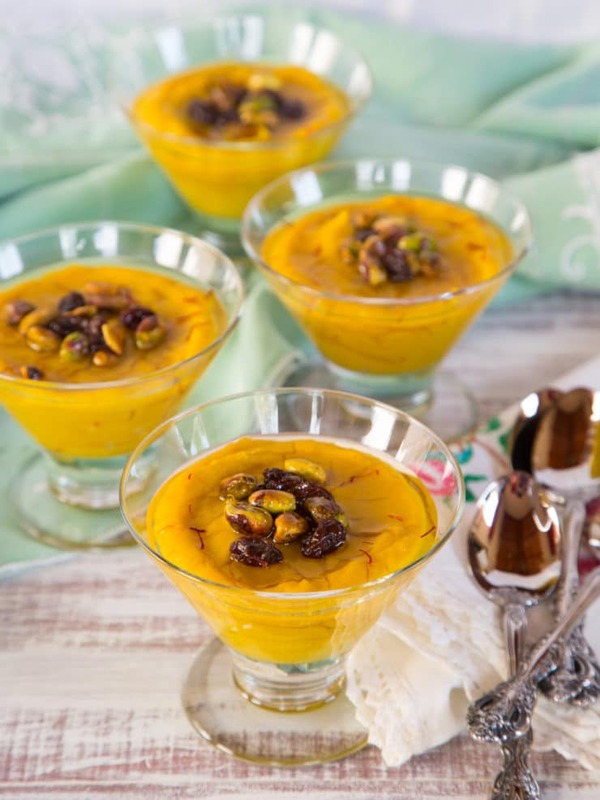 To assemble, top the pudding with a few pistachios and raisins, then drizzle with the orange blossom syrup. If you're feeling extra fancy you can also garnish with a few saffron threads. Here are the other tasty contributions to Catherine’s virtual baby shower! Divine…easy to make, but stay by your cooker! Wow, this was really special! I love that it’s gluten free, and really very simple to make. Your recipes always turn out exactly the way I want them to. Thank you! I am Saghar from Iran. I becom very glad when I see an Iranian dessert in your home page. I see saffron in your dessert glass. Here we don’t use saffron in this way. first we powder it with hand blender, then put appropriate amount of it in a small glass and put a small ice in the glass. let the ice to be molted in the air. then use in persain cake and desserts. I had something like this at an Iranian family’s home when we had dinner with them. It was delicious! Hers had rice in it, like a rice pudding. It was yummy. I just ordered some amazing Saffron. Can’t wait to make this! Where did you order saffron? My dad has been looking for a good place. If there is more yellow then red don’t use it. It is purest when red. My email is sammymt53@yahoo. Cannot wait to try your scrumptious dessert!! Wonder if I could use almond milk instead of coconut milk? This is simply gorgeous! That color is just to die for. Pinning and making! This sounds incredibly delicious…thanks for sharing, Tori!